The New York Times has posted an extended interview with Palm CEO Ed Colligan. In the interview he discusses a number of current topics including the RIM legal drama, open source software, the Microsoft partnership, competition, the growth of smartphones and talks a bit about their "next-gen product" with broadband connectivity. Thanks to Tim Carroll for the tip. I don't see Linux in the future after reading this interview. He does talk positivly about using the Palm OS platform. Ed Colligan is with Palm, the handheld manufacturer, not Palm Source, the OS company now owned by a Japanese firm. He makes hardware, not operating systems. Frankly, this struck me as a fairly disappointing interview, full of buzzwords, bereft of content or focus. I know that. But they could possibly use Palm Linux. They probably will use Palm Linux, once it's released. But in the meantime, it benefits a hardware manufacturer to push the products he will be releasing soon, rather than products he might be releasing late next year (my guess). It would have been nice if the question had come up, though. Is it just me, or are a lot of Colligan's comments and responses a little hollow? He seems ill at ease with the technology his future depends on, judging by the fudged sentences in his answers. How many times did he duck out of answering the questions on Open-Source. Seems to me that he doesn't want to p*ss Billy Gates off before the Treo W has hit the shelves with its plain silly screen resolution (the only real differentiator over other WinMob smartphones if you ask me!). Palm on Linux is still a way off - this interview has made me feel a bit twitchy about the competence of Palm's leadership. Just praying my T3 doesn't die anytime soon. The interview surprised me. I did not realize you could become CEO of a public company with such poor interview skills as Colligan demonstrated. An NYT interview is a rare opportunity, and to be as unfocused and off-message as Colligan was is to waste it. But then, right now, Palm's message is a bit unfocused. I wonder if it's only just dawning on them exactly what the got into when they decided to go dual-platform for the software. You hit the nail on the head there, KV. The company is hitching all of their wagons to the WinMob Treo & hoping it's a winner. Palm has put themselves in an impossible situation--they rode the coattails of the Treo 600 & 650 FAR too long. The 650 has feeble specs (especially RAM) in comparison to the rest of Palm's lineup (not to menion the competition!). If a 700p were to appear it'd likely steal much of the thunder of the 700w. Yet if Palm DOESN'T produce a viable POS-based Treo upgrade in the next couple of months they'll lose their last major bastion of loyal POS users. This is PRECISELY what Palm gets for not putting out SOME kind of updated Treo in CY '05. Even if they had just doubled the RAM and updated the OS/software bundle it'd have been enough to keep POS Treo sales strong up to (and through) the launch of the 700w. Also, this "pick a carrier per Treo" strategy reeks of greed. Most users are going to stay with whatever carrier thay are currently happiest with (Verizon in my case) and not jump around willy-nilly just to get the latest Treo. Even some semi-concrete news about what is in store for this spring ("A LifeDrive 2, a midrange media-centric PDA" etc) would have been appreciated in this interview. I know Colligan cannot say TOO much right now but at least he coulda thrown us a few bones/morsels! Those firmware updates were like a "Dear John" letter to the users that kept Palm alive up to this point. They're skimping so much I'm expecting the next Palm PDAs will be free in a McDonalds Happy Meal. ALL it would take is to introduce a "refreshed' 650 with 2x the RAM and all of the OS updates rolled up into the shipping ROM...and updates to VersaMail, Blazer, DTG, PTunes instead of Real etc. would be appreciated too. That'd allow Palm to have a "new" POS Treo without spending more than a few bucks. They could even intro it for a few bucks more than the Treo 650 is currently being cleared out for by some carriers. THEN, include a higher mAH battery standard on the "refreshed" Treo and make that an optional purchase for all 650 owners. It's SO simple, Palm! You can use smoke & mirrors and a bit of actual device upgrading (more RAM) to create a WHOLE NEW UNIT! The cell phone companies release incremental upgrades all of the time--you can too! It's so ironic--the T|C lasted nearly forever based on STRONG hardware specs. But Palm never got around to updating its OS or its bundled apps etc. The 650 has received a TON of firmware/os/software updates but its hardware is what is dating/strangling it right now. I'm shocked The Times actually published this stream-of-consciousness yammering by Colligan. He's obviously shooting off the cuff and the reporter should have at least edited his responses for clarity. Still, unless he was drunk at the time of this "interview", Colligan has no excuse for not coming up with intelligent, focused responses to the questions. Someone in his position should not be giving amateurish answers in an interview with The New York Times. Obviously everything he says is closely analyzed for clues by both investors and Palm supporters alike. W T F was Colligan thinking??? Voice wasn't interview the most exciting piece of spin since your, ahem, "grilling" of Mr. Mace/Hackbod/Beersy this past summer on AAP? That was a classic and it's a shame Ryan cannot get Colligan to do a roundtable session with a group of PIC "regulars". My guess? The Times must indeed be hard up for some compelling copy this close to year's end. AND...someone at Verizon gently *nudged* the Times into running this piece on the eve of the "official" 700W launch. Expect a followup piece in early January proclaiming the virtues of the 700W and Palm's impending "renaissance". The reason he didn't say anything about Linux/open source plans is due to being SO deeply in cahoots with M$/VZW at the present time. The 700W might be the only "important" piece of hardware Colligan's company releases in '06 (aside from a final few ~$200 FrankenGarnet POS rehashes). Best to sidestep ANYTHING that might make the latest (final?) cash cow look a little less appealing! For the record, VZW's on a roll right now...CDMA Razr, Treo 700W, Moto Q coming in early '06. That AAP thread was possibly the most surreal thread I've ever been involved in - with the exception of the PIC ones with the vivacious Ms. Hackborn. Too bad that dumba$$ Ewan deleted several of the posts. Funny how Dianne evaded the simple questions about PalmLinux + Cobalt, isn't it? Beersy tried to rescue DK and ended up making a fool of himself (as usual). Colligan would never agree to an interview with me since I would ask the questions he doesn't want to answer. It's time for Palm to stop the B.S. and the SPIN and get back to simply making good devices again. As I posted elsewhere, the Windows Mobile Treo was supposed to buy Palm a little time until PalmLinux would be ready. The only problem is Palm then lost control of PalmOS in the meantime. OOOPS! Ohhhh how Palm wishes they had never fumbled the ball on spinning out Palmsource! Right now they would be blazing a trail on OS6.1x and looking forward to PalmLinux. All in house. M$ would probably still bea competitor, regardless of the "critical mass" spin. At least Palm could have pulled and Apple and ended up a niche player with it's own OS. Now, they are swimming with the sharks and have no way to retreat to a niche when the M$/Moto/HTC machine rolls over them. What surprised me most was Colligan's admission that the Treo is partly cannibalising Palm's PDA business. Which raises the question, how many new Treo buyers are actually old Palm PDA buyers? And what percentage of Treo buyers are new to Palm altogether? And does this mean that sales are going to taper off once everyone who's already a loyal Palm user that's going to upgrade, does? Yes, a number of Treo owners are "new" to the platform but I suspect that some of these owned a Palm V or III back in the day....went to PPC for a few years before coming back to POS just because of the Treo. And.....yes, sales are DRASTICALLY going to taper off if not collapse completely once it's realized that the 700w is a SINGLE CARRIER EXCLUSIVE for the time being and the Treo 650 hardware is a total joke going into '06. Now so more than ever Palm needs a STRONG, solid entry in the midrange PDA segment. The TX is a step in the right direction (in theory) but it's still too "cheap" and unattractive and lacks the essentials expected in a $300 device (style, charging LED, voice recorder, STABLE OS). A tightly focused lineup of a Z22, Z33 (combining the Zire 31 & Zire 72), TX, TZ (theoretical Palm V successor with metal body and >TX specs), POSSIBLY a LD2, a $200 Treo, and the Treo 700w & 700p (BOTH on multiple carriers) would be key to a strong '06 and Palm being able to coast through until Plinux is ready(ish). Is the next generation product he's referring to the W with EV-DO? Or is he referring to another product that includes broad band wireless that could seize the embattled Blackberry market? Maybe the Tungsten C2 will get it's chance soon. 3G radios for either standard, 2-4GB of flash, nice big keyboard, killer HVGA landscape, expansion, BT1.2 & WiFi. Mmmmmm! PERHAPS there's ar eason Palm is still selling the T|C as "new" on its website...perhaps a C2 is not as far off as we may thing? PRECISELY the specs you mention, Pat, aside from 2gb-4gb of storage--that much aint' necessary what with the CONSTANTLY plummeting SD card prices. No, a solidly built 480*320 T|C2 just as your describe with BT 1.2 and wi-fi. 128mb RAM with a 512mb internal drive ala the T5. NO voice functionality whatsoever--just a blissfully pure data-centric device. What a machine that'd be! With the proper hacking/rehacking/patching, FrankenGarnet MIGHT even be able to handle such a monster (but don't get your hopes up). I am, of course, not expecting anything like the above and will continue to assume the company is pinning ALL hopes on the 700w. Well, Surus, in all fairness, we're doing better today (in theory) than we were a year or so ago. The LD is (marginally) more stable than it was at launch. The T5 is a good bit more stable than it was at launch. The Treo 650 is currently much better (ie as good as it's gonna get) vs. a year+ ago. So the rationale is that since Palm's gotten THIS far and nothing new is on the horizon, they might as well keep hacking away at Garnet just a bit longer and somehow improve its speed, stability, featureset or perhaps a bit of all of the above. Look how solid the T3 was for a first effort at 320*480. Merely adding NVFS & an internal storage drive into the mix made for disasterous results on the T5! Thats my point. If the next gen devices come along there will be initial pain before things settle down. Right so the few Palm faithful remaining should really shut and hope they just keep tweaking Garnet. LOOK at the issues the T|T had upon launch. I vividly recall getting my T|T in Nov '02 and being sooo excited that it could share peripherals from my m505. Then I realized that the UC fit was workable but kinda loose. Then none of my existing apps supported 320*320. A sizable number didn't even support OS5 by that point--and some were never even updated to be OS5-compliant! By the time the software market caught up with the T|T, the T2 had effectively replaced it. Have you ever seen such a wide range of incompatible products running what is essentially the same OS? From the T|T to the Zire 21 to the TX to the LifeDrive...you have a huge variety of handhelds MADE by Palm and all running some flavor of OS 5.x yet there are numerous programs that only run on select models in that lineup. NOT a confidence-inspiring statistic any way you spin it. By and large, bugs/quirks/incompatabilities/non-updated apps/too many OS revs/poor legacy support is one of the factors IMO that has done POS in. I literally have registered programs that worked fine on my T|T only to upgrade to a T3 a few months later and have the app be incompatible, never again to be updated. I've spent MORE money over the past 4 years on registered/retail Palm software that I've had to ABANDON than I am still using some variant of today. Want high-res? Gotta discard 1/4 of your apps. Want QVGA? Discard some more. Want a Treo or an NVFS device? Discard some more apps. What I'm trying to say is that it doesn't matter any more if it's "next gen" or "this gen". Supporting the PalmCONomy=$ paid for users, developers, and peripheral makers alike. By and large, bugs/quirks/incompatabilities/non-updated apps/too many OS revs/poor legacy support is one of the factors IMO that has done POS in. I don't think that's what's killing PalmOS. The average user doesn't buy ANY software for their device and doesn't even know what OS version they have. What will kill PalmOS is its tragic failure to evolve into a modern multitasking, telephony/wireless-fluent OS. I've actually had a pretty good experience with my apps. I'm impressed that I can still use apps that I used in 1999 on my 2005 cutting edge CLIE. Of course, if I had as many apps turn into abandonware as you have, I'd be pretty pi$$ed as well. "Is the next generation product he's referring to the W with EV-DO?" "When you see our next-gen product, it has a high-speed radio in it, literally bringing kind of broadband connection speeds to the device. It totally changes the dynamic of how accessible the Internet is as an information access point wherever you are and whenever you want to get access to it. Everything from looking up the meaning of words, booking a table at OpenTable.com, to doing a Google search on my family history in Ireland as I’m driving through the Irish coast when we’re opening our center over there." so I'm guessing that this next-gen 3G product (Hollywood?) is at least at the stage of functioning prototype. So you use the Sammy OS4 smartphone + your motley crew of OS5 Clies and they meet all of your needs? OS4 is in SOME ways the ideal Palm OS if you are just going to be doing the basics. I loved the one-handed navigation as pioneered by the T|T & co. (ie holding down the center button returns you to the launcher). I detest the "Treo style" one-handed navigation that the newer Palm units have adopted. I was holding out waiting for Sprint to approve the Samsung i500 replacement, but it got dumped at the last minute, so I switched back to the i500 as my main phone. Besides the limited RAM (16 MB), lack of PalmOS 5 (there are one or two apps I like that won't run on PalmOS 4), low res screen and lack of memory expansion, the i500 is a perfect phone. Superb build quality, excellent voice quality, small size (many executives + professionals wouldn't be caught dead with a brick-like Treo geekphone) - everything the Treo 600/650 is not. On the i500 I do miss the slick D-pad and entirely one-handed navigation my Treo 600 had, though. Handspring absolutely NAILED the User Interface with the Treo 600 - I don't think they get enough credit for their intuitive design. I'm using a LOT of freeware and updated shareware these days. Look around - a lot of time you'll find freeware equivalents that are eithe "good enough" or ever far superior to commercial apps. I would call my credit card company and dispute the charge if I was you. There's no excuse for fraud. DateBk5, HandyShopper, APCalc, TCPMP, McFile, BackupMan, PowerRUN, TealAuto, TealLock, DiddleBug, Zagat To Go, CryptoPad, Directory Assistant, YAUC, BeamCrack, HaCkMe, Manana, MultiUserHack, EVPlugBase (or TealMaster), Documents To Go, Ultrasoft Money, PayOffPlus, WhatzUp, RecoX, SFCave, McPhling, Undupe, Filez, DA Launcher, Vexed, FileMan, Picsel Viewer, Mass Transit, Wine Enthusiast Guide, Mi:D, TextTwist, NetFront, SnapperMail, URLSync, SplashID, domino!, Open, Hell Clock and a couple other apps have been on most of my PDAs for years. These apps are either well-supported or are abandonware that was well-coded in the first place and never needed updating to maintain functionality. At this point I don't really care if 95% of my apps ever get updated. Good to know, since I ain't gonna spend $600+ for what could be remaining handhelds with pOS. Don't need another cellphone plan. $$ wasted there. Also would've been paying more $$ for inferior specs. Colligan was evasive because he is avoiding dropping Some big bomb of news prematurely. You naysayers assume that just because you don't know any bombshell news that none exists. I guarantee you Palm is not pinning its future to Win Mob. This will be a temporary cash bonanza but what is to follow is going to blow everybody away. You have to understand the transition to Palm-Linux isn't instant. Stick with what even palm users like you guys mockingly call Franken Garnett and continue to loss share? Or make quick coin on an exciting Win Mob Treo, which gets the company its first positive press in years, and strengthens its bottom line while either waiting for Access Linux, or quite possibly working on its own version behind the scenes? And For the guy who wants basically a Too 650 with more ram, word is already out aboutwhat's supposed to be 3 treos in addition to the announced 700W in 06. More ram and evdo are surely going to be present. Surely one will meet your needs. The Treo has made Palm cool again. Win Mob Treo will be a big cash win. Then as other win mob devices are released to compete with the Palm usability tweaks only the WinTreo has, a Linux based PalmOS device, or multiple devices are released with a huge splash. Palm will promote the superior Linux-Palm and the easy comparison with the existing Win-Palm makes the Linux-Palms advantages apparent even the power user ubber-geeks will abandon win mob. And yes Palm will be more powerful. Win Mob has a ceiling to how good it can be before it cannibalizes its own desktop OS. Palm has no such restriction to desktop level power using Linux as its base. Other form factors will arrive in time. I tell you all the stumbling and stammering, evasive Collogan looks that way because he cannot say the wrong thing prematurely. Palms future is bright and when all is said and done you will look with amazement at how wrong you critics were. This is true of course, but the move to Linux is for OS features (multi-tasking, memory protection, api's etc) and economic (hardware driver support etc). I wonder what features Palm would possibly add to a Linux Treo which a WM Treo would/could not have. Palm's secret sauce has always been ease of use, not features. A PalmLinux may be much more customized, and may therefore be easier to use, but will probably have LESS features than a WM Treo, in the quest for simplicity. Open Source & presumably (if Access makes it happen) the Palm OS user experience & platform "compatability". I agree that WinMob is not going to be dropped after a quick dollar. Palm is stuck in never-never-land at the present and looks to ride both platforms into a time where it can re-evaluate the mobile landscape. Developing for 2 platforms has got to be cumbersome, but how can they possibly wait on Access to deliver with every egg in that basket? If Access lays an egg (sorry for the egg comparisons)with Plinux and Palm has no WM, then they are dead. If they deliver the goods and capitalize on the massive Asian Linux and global open source boom, then they live large and well positioned on the two hottest smart platforms or can wean themselves off WM. Unless M$ just starts dying off, I don't see them dropping it. If both bring the cash, then keep the hardware economies of scale and pay the price for double platforms. If Access lays an egg, then go with an in-house Palm Inc OS or Linux Plan B or stay WM and see how long they can swim with the sharks. I think we may have underestimate the internal dicombobulation that 2004-5 caused PalmOne. On the outside, they basically underwhelmed us with FrankenGarnet, FlashRam & the LD. But inside they were living through the PSRC disaster that Sony gave up on. Everything has surely been turned upside down due to the horrible PSRC spinoff & failure of Cobalt. Palm should really be able to deliver in the next 6 months from the changes made in the past 12. If they position a WM Treo, 700p and two midrange handsets (touching 4X the smart/feature phone market segment) in by CY06', then shares of PALM are warranted where they are now and will double. RIMs troubles only help. HTC, Nokia and Moto are going for the space too, but the market has room for a lot of players in the next 3 years. If Palm plays right and navigates this OS issue, then should make a mint. I, as much as anyone else on this site or out there in the Palm community, hopes & prays that you are right. You must admit that as someone who has followed the scene since the Pilot 1000 launch, I have ever reason to be cynnical and/or a doubting Thomas. I saw the original Pilot revolutionize the market, then watched Palm/3Com grow stagnant (III-IIIxe anyone? ), briefly catch fire with a hot design (Palm V) and then begin a long & protracted downward spiral, only to be saved by the accidental (?) success of the Treo 600. Worst case scenario, as Pat points out, is Access laying an egg. Palm can then continue to hack/rehack Garnet 5.9 and ramp up their WinMob efforts all the while tryng to do their own home-brewed Linux solution. In all fairness, the entire stretch lasting all of '04 and '05 could/should have done Palm in. It likely would have had it not been for the success of the Treo and the T|E/Zire. Still, the quality MUST be upheld and they must not make the past mistakes of abandoning the support of certain models prematurely and alienating users in the process. My friend please recall while Palm took its downward spiral it was Handspring and Palms original bunch which came up with the foresight to put its future into the Treo while Palm kept laying eggs. The fact that once again the single most successful device in the market came from the same minds that brought us the breakthrough devices you spoke fondly of is no "accident." People say Palm Isnt innovative while dismissing the Treo altogether. Yet the Treo is in fact the target that everyone else is shooting for. Sure Palm WAS being run into the ground. The clowns who split the company are gone. Doubt confuse that rudderless ship with what, happening now. Now that the original Crew are again running Palm, look at whales happening. Huge success of the Treo line, talk of several new Treos in 06, the potential and innovation again of the "mobile manger" concept despite the rough edges of the lifedrive, the cash cow potential of its 700w , and a Linux future, I'm confident in Palms direction again. And speaking of the "W."
They are now insiders to Win Mobiles future plans in advance. 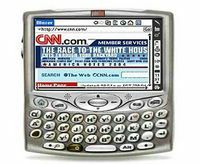 When features that trump the Win mobile devices are released on PalmOS Linux devices only then will MS realize who got the better end of the deal and end the "partnership" with Palm. People think Palm is dumb? How can MS be so Naive? Palm is helping shape win mobile, while still being a competitor? I tell you all, this alliance is not the Microsoft coup everyone thinks it is. MS is sleeping with the enemy, and only she (Palm)knows she is only using him. Ms will dump her, but only after she has stolen what she wants from him. Maybe Palm has some supersecret 'bombshell' project that Colligan doesn't want to talk about. However, the NYT article is a textbook case in how not to avoid talking about something. It is possible to be evasive without being inarticulate. I'm using a Tablet PC and its guessing at my handwriting. Agreed. A big BAH! to corporate double-speak. "Had they absorbed HS and not split PSRC, then they would be veerrry strong today. Hindsight is ..."
Palm bought its name back correct? Soon only they and not Access will be able to use it. I really believe they are doing their own brand of Palm Linux. Colligan has said already if it were him the OS would never have been split off. Palm unsuccessfully tried to buy it back. They bought back the name. "Garnett" soon can no longer be called "PalmOS." Yet "PalmOS" will live on as a Palm device exclusive OS. Should Palm build its own Linux based Os guess what? That my friends is in fact PalmOS. Who cares about Garnet? Even Access brand of future OS isn't really anymore Palm OS as we knew it anyway. Building compatability with the older OS would seem OK as Macs have done it for Years, and nobody challenges that win mobile app that is doing it now with Palm Os. And backwards compatability is all that matters in the new OS. Palm has in fact done an end around to legally steal back their Os. Funny, it usually goes down the other way when MS is involved. And seeing Gates all grinning at the press conference you know he is thinking he's done it again. Just like everyone else thinking it sends a signal they are giving up on Palm OS, its just a matter of time. Win Mobile gains momentum as even Palm acknowledges windows superiority. forgot to add, proof of the Palm doing its own Linux is that they are hiring Linux people. At the very least they are going to seriously tweak the Access OS themselves and call it "PalmOS" to the same effect. "PalmOS" is exclusive to Palm tweaked version of the Access Os. But seeing how badly they wanted control my guess remains they plan to do it themselves. I doubt they want to remain so dependant. Why rely on others and pay for what you can do better? With the name back and a home grown OS they really don't need Access ab all. He who rides the tiger can never get off.